Above Board Chamber of Florida is proud to present expert panel discussions on “Social Media Policy for Business” in Fort Myers on Thursday, May 8th from 11:30 a.m. to 1 p.m. at the Landings, 4540 S Landings Drive, Fort Myers and in Naples on Monday, May 12th at Hilton Naples located at 5111 Tamiami Trail N, Naples. The panelists for the Fort Myers meeting will be: Brent Struense, Marketing Director at WFTX-TV/Corporate Creative Manager at Journal Broadcast Group FOX4, Waddy Padilla Managing Editor at Florida Weekly-Fort Myers, Journalist, Screenwriter, Ingrid Molina President of Fuller Online Solutions and Michelle Hudson, Digital Strategist at CONRIC PR & Marketing. Susan Bennett, President of Marketing & Media, LC will emcee for the Fort Myers event. The panelists for the Naples meeting will be: Cassandra M. Engeldinger, Marketing Communications Specialist at Arthrex, Inc., Todd Allen, PA at Goede & Adamczyk, Ingrid Molina, Director of Marketing at Fuller Online Solutions and Batya Maman Sabag, owner of Social Connect LLC. Sue Huff, President of E. Sue Huff and Associates will be the emcee for the Naples event. Reserve your seat today! Register early to receive the discounted rate. Visit www.aboveboardchamber.com to register for Fort Myers and Naples. Non-profits can put up a free table, and members can put up a table for $25. The panelists will offer real-world experience to help professionals learn the techniques develop a social media policy at your company. Come meet the panel of experts on Thursday, May 8th and find out the pros and cons of a social media policy and if one is actually needed. For more information on the event or on how to become a member of the Above Board Chamber, contact Jeanne Sweeney at 239.910.7426. 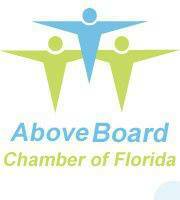 The Above Board Chamber of Florida is dedicated to bringing people of faith together within the community, in the workplace and amongst one another. Their mission is to supply members with the tools that will allow them to take every aspect of their lives Above Board.